Metrowest Veterinary Associates, Inc. focuses on the care of companion animals including cats, dogs, rabbits and pocket pets. By stressing client education and treating our patients, clients and staff with dignity and respect, we offer a friendly environment in which we practice quality medicine and surgery. Our practice was established in 1992. After functioning as a house call practice for 18 months we moved in to our newly built clinic in October of 1993. We offer a variety of services including wellness examinations, vaccinations, blood work, surgery, dental care, medical workups and radiology. Additional surgery and ultrasound procedures are performed at the clinic by board certified outside specialists. We also offer boarding on a limited basis as a service to our clients. The clinic is open six days a week (we are closed Sundays). Office visits are by appointment, but we are able to accommodate emergencies during our normal clinic hours. After hours emergencies are referred to several emergency centers in the vicinity. 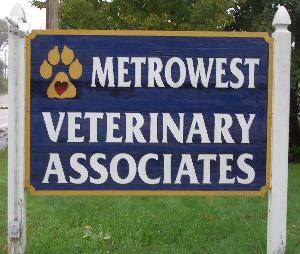 At Metrowest Veterinary Associates we employ a team approach where veterinarians and staff members works together to help meet the needs of our patients and clients.